A former industrial site is to be developed as a community hub and youth centre called the Aspire Centre. Although Adam Eastwood and Sons Ltd is no longer trading and has gone into voluntary liquidation, the well-being of the community of Warsop remains very much in the hearts and thoughts of the trustees of the Sir John Eastwood Foundation. 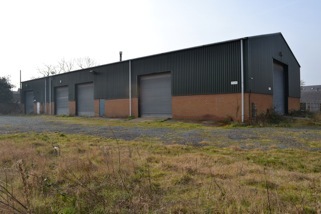 Through a very generous donation from the Foundation, Warsop Youth Club (WYC) have been able to acquire the former Adam Eastwood garage depot site alongside the Health Centre to the rear of Church Street, on the understanding that the site is to be used for the benefit of young people in the parish. Some members of the community may remember Shine running activities at the site including a community bonfire. The Eastwood Foundation recognised the social value of these activities and originally offered the site to Shine. Unfortunately Shine at that time was not in a position to take up this offer. However Big Warsop recognised its potential and pursued the offer with Eastwoods. Warsop Youth Club was approached as an established charity in Warsop parish to see if they would be prepared to take the project forward. The board of Trustees enthusiastically agreed to the proposal and the transfer of the site was completed in January this year. Big Warsop funded work to establish the feasibility of the project, provisionally known as the Aspire Centre and have now given the ‘green light’ of support and are kicking off the project with £100k for initial refurbishment work. WYC are currently working to resolve planning issues at the site but it is hoped that work will start in the next few months to get the building ready for use. Outline plans for services include skills training, taster courses, and volunteering opportunities as well as leisure activities for young people and the wider community. WYC is working in partnership with Big Warsop, the newly launched Shine Nottinghamshire and other organisations to ensure that the centre meets community need and becomes an innovative flagship project that Warsop and the Eastwood Foundation can be proud of. Warsop Youth Club (WYC) would like to express sincere thanks, on behalf of the community of Warsop, to the trustees of the Sir John Eastwood Foundation for their generosity, to Big Warsop for being a catalyst in making this project happen and to Shine, without whose initial vision and hard work this opportunity would not have been offered. For more information please contact office@bigwarsop.co.uk As the project progresses regular updates will be provided here, including information for those wishing to become more involved.